This is all a bit like déjà vu. You’ve ended up back at the beginning…or have you? It’s the same, but different. There are no monsters lurking about for some reason. The place is really rather dull unless you like fêtes. The princesses are trapped behind their court. So its up to Bartz and Krile to figure out how to save the world (no pressure there). Split at your earliest convenience and let the princesses deal with their royal fate. You may be wondering just where to head. As you leave a runner arrives with a clue. A bridge has finally been completed to the west. Head that way, cross the bridge, and make your way to a familiar cave. It’s not immediately clear where to go from the pirate cave. Boko can help you cross water (streams and rivers), but not the ocean. Your journey will be mostly on land with a little wading across the shallows in rivers. For now your only point of interest is the town of Tule. You can pick up a bit of gossip there…but how do you get there? From the pirate cave head south and then northeast back towards Castle Tycoon. A break has opened in the mountains surrounding the castle. Waddle through it and go in a northwesterly direction. Cross the river and go west. You should see a cave—formerly the pirate’s cove. (Where did their ocean go?) Skirt around it and continue through a bit of forest and then south around a horseshoe-shaped break in more mountains. Follow the coast up again and finally you’ll come across Tule. Once you’ve tired of prodding the locals for information, continue on your journey west. Turn south at the gorge and continue until you get waylaid. 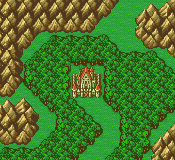 You only have Bartz and Krile for this battle. Equip one for defense and the other for offense. The key to success is once again a swift casting of Golem. Antlion attacks mainly physically for about 600 points of damage. He occasionally casts Digestive Acid, which gradually fritters away your hp. Lastly he uses Dischord to halve your level. He is weak to water. A healthy dousing with Aqua Breath only amounts to around 750 points of damage. You may want to bring a ninja along to use Water Scrolls, which inflict about 1,300 points of damage. So long as your level isn’t halved physical attacks may be your best bet. When you finally whittle his hp down he runs away. You’re left with 5 abp. Run around the cave a bit pondering how to escape. Eventually a solution presents itself. Once free continue in a southerly direction until you reach a cave. All you need to pwn Antilion is a Ninja and a Summoner with !Blue. Cast Golem and then have at him. I had a Ninja with Twin Lance and Ice Brand, and I had Krile as a temporary summoner with blue magic. Aqua Breath and 1000 Needles. Owned. Well, on the ROM version that lady says: "I had had a slight feeling that maybe you were Sarisa." Perhaps one 'had' doesn't go on that sentence. But she clearly means that when you went to Castle Tycoon for the first time (after Walz Tower) she felt that Faris may be Sarisa. By the way, why isn't here any Strategy?